Recently, we had an interesting trip to outside Sunda. 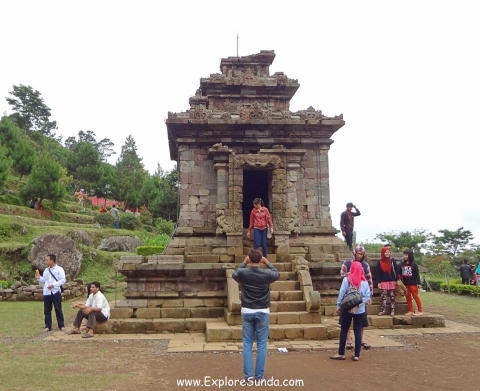 We visited Candi Gedong Songo in Bandungan, Semarang, Central Java. 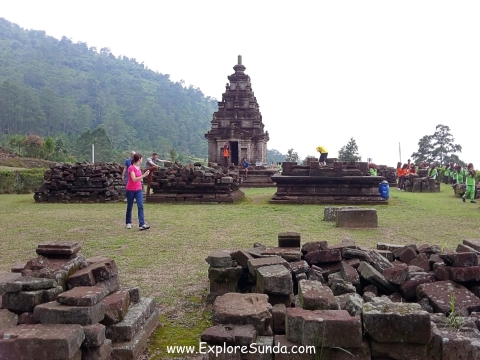 We, at ExploreSunda.com, decided to write about this temple, since it is not as popular as Borobudur, Prambanan or Dieng temples yet, but it is unique in its own way. There are some distances between each temple. The first one is approximately 100 meters from the entrance gate. Other temples are further away from the first one. During a clear day, we can see the ninth temple at the top of the highest hill, several hundred metres away from the first temple. Hence, there are two options to visit those temples: walk uphills following the stone path or pay for a horse ride. 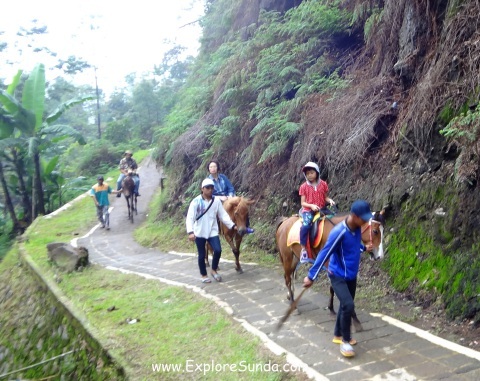 In my opinion, the horse ride is the most fun way to visit Gedong Songo temples. There are three options of the horse ride, depending how many temples we visit. We, at the ExploreSunda.com, recommends to take the one that visits all nine temples plus a hot water spring. Although it is the most expensive (In 2014 it was Rp 70,000 per person for a domestic tourist, the international tourist paid a bit more expensive), it’s definitely worth it. The tour takes approximately one hour. The first temple we visit would be the furthest one, the one on top of a mountain. The scenery is breathtaking, . It was my first experience to ride a horse uphill and it’s very fun! We will pass through pine forest and vegetable fields, until we reach a field where the horses can take some rest and we can walk around to visit the temples. There are three temples here, we must walk up fifty something stairs to reach the highest temple. Whenever the day is clear we can see beautiful valley below, but I think the mist that often surrounds the mountain makes the temple looks more magical :) The other two temples is in the same level as the field. You may notice that each temple is not a standalone. It looks more like a small complex of its own, where it has one main temple and a couple of smaller temples in front or besides the main temple. Unfortunately, some temples are ruined, where we can only see the foundation. It also used to have a statue inside each temple, but many of them are empty now. Finishing up here, we continue riding the horses to the next destination: the hot water springs that contains sulphur. People believe the water can cure many diseases, especially skin diseases. Since it is in the slope of a mountain, the place is not big. There are several bathrooms if you want to take a bath. From here we continue going downhill passing the remaining temples. Each temple is different from the other. I wish I know the history behind each temple, I believe they would be very fascinating. Researching the internet, I only found out that Gedong Songo temple is an Hindu temple and archeologists predicted it was built around 8 century by Sanjaya Hindu Dynasty, who ruled Central Java at that time. 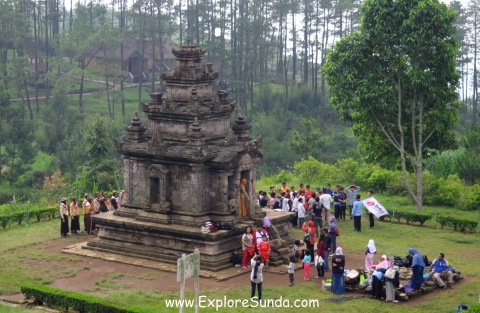 Similar to Dieng temples, Gedong Songo temples are located in the highland, approximately 1200 meters above sea surface. It is surrounded by pine forest and locals vegetable fields. The good thing about it is its cool temperature (approx. 19-27 degrees Celsius) and the greenery surrounds it. 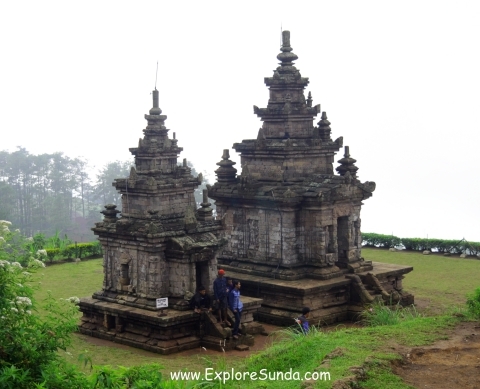 Thus, the best time to visit Candi Gedong Songo is in the morning to mid afternoon, before the mist covers the mountain. The best way to start early is to spend a night in the hotel at Bandungan. It is close to Semarang, hence, it becomes a favorite place for a weekend getaway due to its cool weather. So, no wonder there are many small hotels here, range from inns to 1 or 2 stars hotels. I guess it would be a bit difficult to secure a room during weekend, but if you come here during weekdays you can just drive around and ask the price directly to the front office, even negotiate the price! You might find some hotels in the internet too, but if you have time I think it would be wiser to just come and see the room first before you book it, since often the pictures in the internet was taken when the hotel is still new. You will be surprised with so many hotels are operated in the small place like Bandungan. The much better option of accommodation is to spend a night in Semarang. Since Semarang is a big city, you have many choices: from an inn to the five stars hotel. The only drawback is that it takes more than an hour to reach Bandungan due to the traffic, although the distance is only 45 kilometers. In our experience, it was difficult to find the direct way from Semarang to Bandungan. We eventually drove too far south until we reached Ambarawa and from there we went up north to Bandungan via a small road. Since the location of Candi Gedong Songo is a bit secluded, it is difficult to find public transportation that reach here. Of course there are some that will reach the village of Bandungan. Thus, the most convenient way is to drive or rent a car, either from Semarang in the north (approx. 45 kilometers) or Jogjakarta in the south (approx. 70 kilometers).